Did Pat Quinn And The Chicago Democrats Slip In A $20M Slushfund To This Year's Budget? You've heard the phrase: "Meet the new boss. Same as the old boss", right? 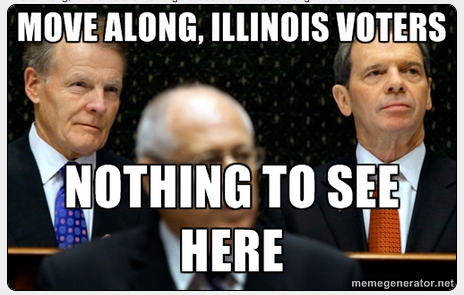 Well...that's apparently what we're dealing with in Illinois with Pat Quinn as Governor. He's already in a tough spot trying to explain how his last 'slush fund' called NRI was doled out right before election day to gin up votes. But...now it looks like he's at it again? I guess you have to feed The Machine if you want to win in November, right Pat? The General Assembly's top two Republicans said they've found a mysterious $20 million appropriation that in their view looks suspiciously like the Neighborhood Recovery Initiative "slush fund" that already has the Quinn administration in legal and political hot water. But Mr. Quinn's office says the money is going to train 5,000 youths to get jobs instead of getting into trouble. The charges came today when the Legislature's GOP leaders, Sen. Christine Radogno and Rep. Jim Durkin, said at a Chicago news conference that they have increasing questions about a $20 million appropriation for the Department of Labor that showed up in a pending appropriations bill just days before lawmakers enacted Mr. Quinn's proposed fiscal 2015 budget in May. Republicans received "no response" when they asked in committee and on the floor what the money was for and who would get it, Mr. Durkin said. "There was dead silence," he said, with even Democratic committee chairs professing ignorance. When will this stuff stop? Here's hoping in comes on the first Tuesday in November.